The American painter Elmer MacRae began his training at the Art Students League in New York in 1894. One of his teachers was John H. Twachtman, who also conducted summer plein-air painting classes in Cos Cob, Connecticut. MacRae followed Twachtman to Cos Cob for three summers. In 1900 he married Emma Constant Holley, whose parents owned the boarding house in Cos Cob where many artists stayed. MacRae took to heart Twachtman’s advice to experiment and always seek the unusual. His painting style was influenced by Impressionism, Post-Impressionism, and Japanese prints, and he also became skilled in the use of pastels. 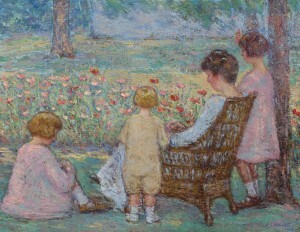 He exhibited his work in solo exhibitions to positive reviews at the Holley House in Cos Cob in 1908-1911, and had solo exhibitions at commercial galleries in New York, Chicago, and Boston in 1911. In 1910 he organized the Pastellists, a cooperative exhibition group devoted solely to the medium. Between 1911 and 1912 he mounted three Pastellists exhibitions, handling finances, publicity, and installation. He was also a key organizer of the Greenwich Society of Artists, of which he was the first secretary. MacRae was one of the founding members of Association of Painters and Sculptors, serving as treasurer. As one who had experience organizing exhibitions and was receptive to new art, he played a key role in organizing the Armory Show, defining its character, and making it a sensation. Though his poor performance as treasurer probably contributed to the Armory Show’s lack of financial success, he contributed more to the success of the exhibition than most art historians have given him credit for. The content of this essay is derived from Susan G. Larkin, “’So many thrills, so much excitement’: Elmer MacRae’s Role in the Armory Show,” in The Armory Show at 100: Modernism and Revolution, Marilyn Kushner and Kimberly Orcutt, eds., exh. cat. (New York: New-York Historical Society, 2013), 69-79.